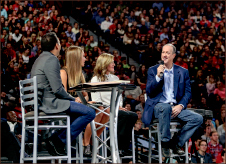 For the first time in the family’s history, Jim Kelly, his wife, Jill Kelly, and their daughter, Erin Kelly, took the stage together to speak to students during Convocation Friday, Oct. 25. The three spoke about God’s goodness in the midst of trials, marking their first public appearance since Jim Kelly, a Hall of Fame quarterback for the Buffalo Bills, was declared cancer free nearly two months ago. 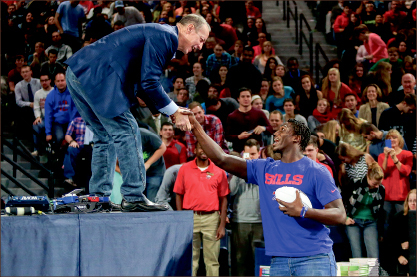 Smith and Jim Kelly then autographed four Hall of Fame footballs, and Jim Kelly threw them to members of the crowd, showing off some of the skills that led him to four consecutive Super Bowls. During the question-and-answer format Convocation, the three spoke about the many trials they have faced as a family, highlighting the eight years spent with their son and brother Hunter Kelly, who was diagnosed with Krabbe Disease at only 4 months old. Though Hunter Kelly’s disease was incurable, Jill Kelly acknowledged that the diagnosis pushed her to rely fully on God. According to Jim Kelly, his wife, whom he described as a “strong woman of faith” and praised for her strength in the midst of all the family’s hardships, helped him to find Christ following her own life-changing decision. Now, Jim Kelly said his faith is what has given him strength to beat the cancer that once lived in his upper jaw. “Even though I’ve been stricken with cancer and I’m still in the fight of my life, I know God has plans for me, and I believe that,” Jim Kelly said. Erin Kelly explained that the struggles her father has endured and the sacrifices her family has made have not discouraged them, but rather have given them an opportunity to rejoice in God’s goodness. Jim Kelly also explained that, in addition to all he and his family have learned over the last months, he is grateful for the opportunity to make an impact on others’ lives.